Sometime earlier in the year I received a copy of Histronauts An Egyptian Adventure and A Roman Adventure. I read them, reviewed them (read it here here) and then popped both on our library stock. My review was glowing, but the real stamp of approval for these books has been from the children in the library. They zoomed in on them straight away and within moments they were borrowed, and have rarely been on our shelves since, because they are books children want to read! 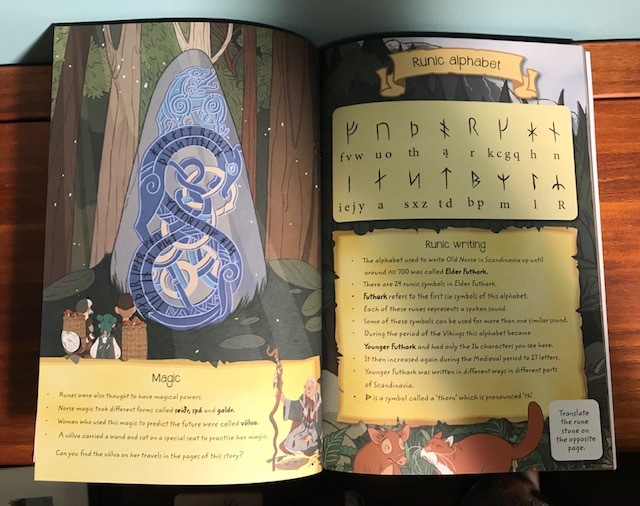 So I’m delighted today to look at the brand new book in the Histronauts series, A Viking Adventure written by Frances Durkin, illustrated by Grace Cooke, designed by Vicky Barker and published by B Small Publishing. 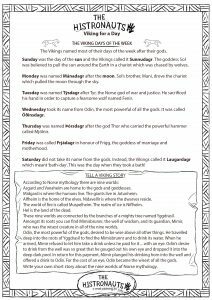 Vikings is a major topic in schools and one which we get asked about regularly in the library. And when asked, I skulk over to the Viking section and point out all the informative, but fairly standard non-fiction titles on this topic. They certainly do the job, but do they really inspire children’s learning? Alongside this, I had a chat recently with a parent about the amazing ability graphic novels and comic books have in exciting and inspiring children to read. Particularly children who find long, wordy books daunting or unexciting, some children need a little more visual interest. 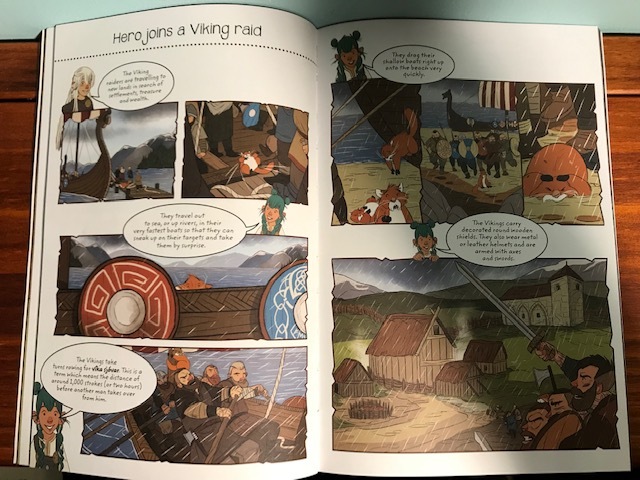 SO, baring those two events in mind, welcome to the stage the answer, non-fiction, story, graphic novel style book for children based on Vikings! 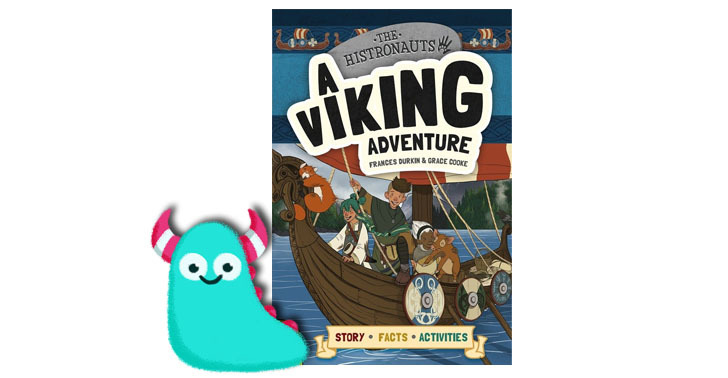 The Histronauts books are incredible because they combine the educational importance and value of the history topic, with a comic style story which runs alongside it, with added activities to reinforce both. 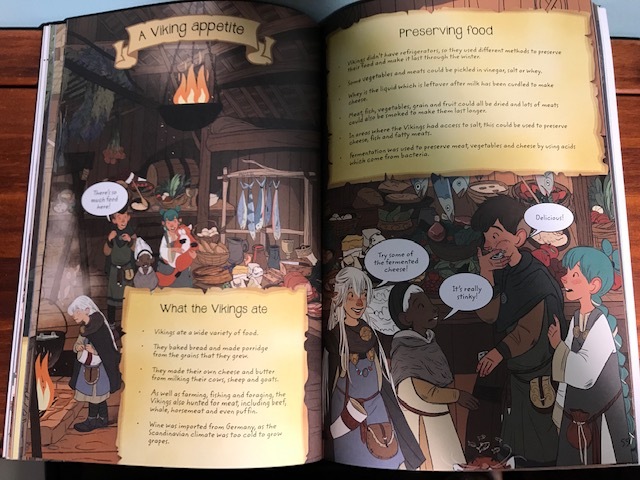 A Viking Adventure is easy to pick up and read, quick and engaging and the perfect educational tool. The basis of these books are that the Histronauts are dragged back in time, and as they explore their new environment they must try to find their way back home. Why didn’t I think of this genius idea? The perfect way to really bring history to life in a fun way. Grace Cooke’s illustrations in this book are wonderful. Bright and colourful but with a stylish graphic novel feel to them and bags of detail giving the book endless readability. The characters are fresh and modern and people I think children would want to hang out with. 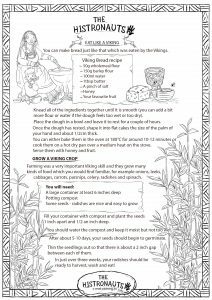 Throughout this compact book every aspect of Viking times is covered from currency, viking ships, burials, farming, food and so much more. Tons of elements intertwined within the story. It’s very easy to distinguish the facts out of the story so nothing is watered down here, it’s just put together in a format that children will thoroughly enjoy reading. 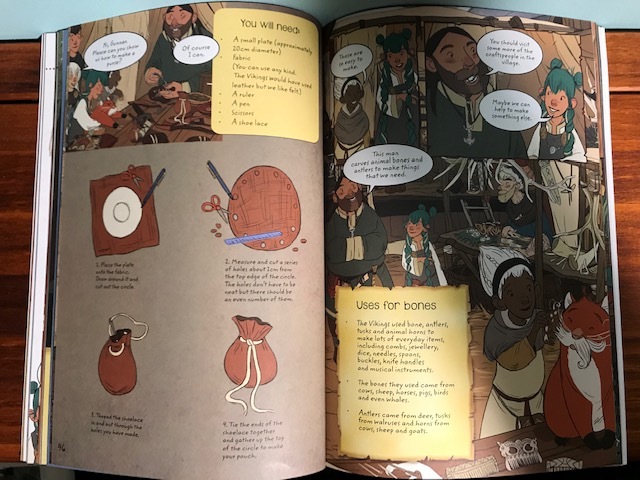 And as if this wasn’t enough, to keep the book interactive and to reinforce the learning there are numerous activities in the book including recipe ideas, a board game you can play, crafts and even a little quiz. For home schooling, this is as good as it gets. When you’re wanting to support children with dyslexia with their reading, this is the kind of book I often recommend having talked to many parents. Many of them say that comic and graphic novel style books are the most effective in engaging a child who has lost confidence in their reading, who has maybe developed a fear of reading through their own educational struggles. The Histronauts is exactly the kind of book they say works with children who have dyslexia, are maybe reluctant to read or have difficulty maintaining attention while reading a book with heavy text and dry information. The Histronauts series of books is already becoming a firm favourite in my library, and is without doubt a most fantastic use of illustration, design and writing to encourage learning in children. B Small have chosen the most popular school topics and also the most interesting ones to focus on with Romans, Egyptians and now with Vikings. 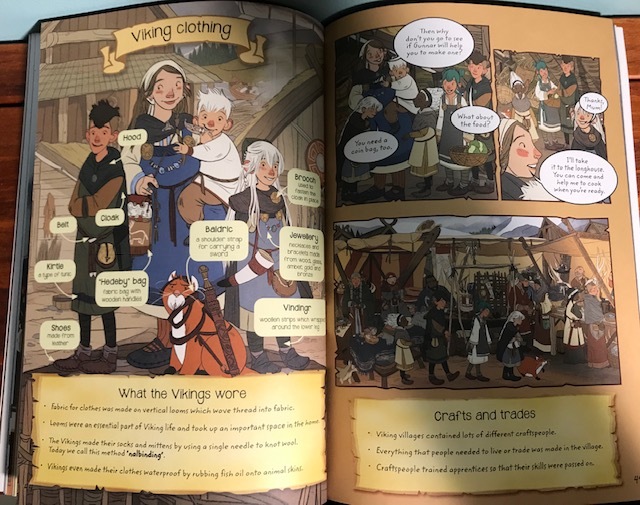 A Viking Adventure is a treasure of a book, an absolutely superb addition to this series, and one which I know will be my go to recommendation now for children who want to learn about all things Viking in a way which brings history to life for them. It’s a great big monster thumbs up from me. 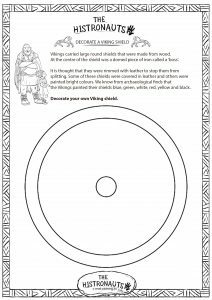 I am also very excited to share with you four fantastic activity sheets you can use in conjunction with A Viking Adventure to support children’s learning. 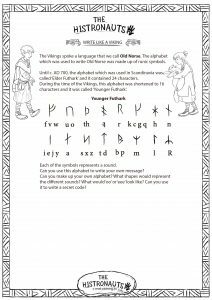 Click on the images to download the PDFs for each worksheet. Histronauts, A Viking Adventure is released on December 17th, 2018. Big thanks to B Small Publishing for sending me a copy of the amazing A Viking Adventure to review, and thank you for reading this adventurous Book Monster review. Next Post Disney Animated Classics – Familiarity doesn’t always breed contempt.